10 days ago I asked readers to answer the question – What is your favorite Lens? Today I spent a few hours collating the 233 responses to the question in the hope that it might turn out to be useful information for those in the market for a new lens. Overwhelmingly the most popular brand of lenses mentioned were Canon and Nikon. Of the 302 lenses mentioned 52% were Canon, 24% were Nikon, 12% were Sigma and the rest were a mixture of Pentax, Olympus, Tamron, Tokina, Minolta and a couple of others. As a result of the makeup of these results I’ve decided to give you some overall winners and then drill down a little further into three categories of Canon, Nikon and ‘Other’. I could have drilled down into the ‘other’ section more but there were just not enough lenses for each manufacturer. I was quite surprised by the the first place winner because by no means is it a cheap lens but the result was extremely clear – 22 of the 302 lens mentions were for the 70-200mm f/2.8 IS lens. Of course following it up are the ‘nifty 50’ lenses which are always popular. Of course the question of this reader survey was asking about favorite lenses – and the winner is a worthy one as it is fast, has image stabilization, has a great focal range for all kinds of applications and is superbly sharp. Now lets drill down further and look at manufacturer specific lists. You’ve already seen the top 4 – so let me give you the top 10. I’ve included a few comments on each which I’ve taken from the comments left in the previous post as well as my own experience as a Canon user with many of these in my bag. 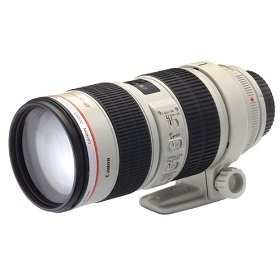 Canon EF 70-200mm f/2.8L IS USM Telephoto Zoom Lens – fast, great for portraits, weddings, sports, versatile focal length. Quite a heavy lens and not cheap. Canon EF 50mm f/1.8 II Lens – for its price perhaps the best value lens in terms of the quality of output. Canon EF 50mm f1.4 USM Standard & Medium Telephoto Lens – a step up from the f/1.8 in terms of build quality and results but more expensive. Canon EF 24-70mm f/2.8L USM Standard Zoom Lens (pictured right) – a great walk around lens. Faster than the 24-105 but no image stabilization. Canon EF 24-105mm f/4 L IS USM Lens – often compared with the 24-70mm this lens is not as fast but has image stabilization and an extra 35mm reach. A worthy contender for a great walk around lens. Canon EF 70-200mm f/4L USM Telephoto Zoom Lens – not as fast as the 70-200mm f2.8 and without image stabilization but still a very sharp lens, a considerably cheaper option and lighter too. Note: between these two lenses is also a 70-200 f2.8 lens without image stabilization (this lens came in at #11). Canon EF-S 17-55mm f/2.8 IS USM Lens – another alternative for a walk around lens if you take wide angle shots. A fast lens and loved by many. Canon EF 85mm f/1.8 USM Telephoto Lens – a prime lens that gets great reviews. Also check out the f/1.2 version which is super fast but pricey. Canon EF 17-40mm f/4L USM Ultra Wide Angle Zoom Lens – I love this lens. It’s not as fast as some but has been great for landscapes. Canon EF 100mm f/2.8 Macro USM Lens – another of my personal favorites. If you want to take Macro shots this is well worth considering. Interestingly it also takes great portraits. I’m going to keep this list to a top 8 rather than a 10 – simply because there were less Nikon lenses mentioned and a few less clear favorites. Please excuse my comments on each lens – I’m not a Nikon user and so have relied upon the comments of others more. Nikon 50mm f/1.8D AF Nikkor Lens – Nikons ‘nifty 50’ is a much loved lens and similar to the Canon version – for its price and quality it is a must have in your bag. Nikon 18-200mm f/3.5-5.6 G ED-IF AF-S VR DX Lens – this lens makes a great option for everyday shooting with a fantastic focal range which gives both a reasonably wide angle and reach. The vibration reduction makes it particularly attractive and it is a reasonably affordable lens. Nikon 70-200mm f/2.8G ED-IF AF-S VR Zoom Nikkor Lens – this lens has had some great reviews and is renowned for being a high quality camera. Again it has vibration reduction, is relatively fast and is great for portraits, weddings, sports. It’s not cheap though. Nikon 80-200mm f/2.8D ED AF Zoom Nikkor Lens – lenses in this focal range featured heavily in both the Canon and Nikon lens and it is no wonder – its a really handy focal range. This one is quite a bit cheaper than the previous 70-200 but you lose Vibration reduction. Those mentioning it in our survey raved about it. Nikon 105mm f/2.8G ED-IF AF-S VR Micro-Nikkor Lens – it is interesting that Macro lenses feature on both Nikon and Canon lists. This one however has vibration reduction making its fast aperture even more useful. Nikon 17-55mm f/2.8G ED-IF AF-S DX Nikkor Zoom Lens – another fast zoom lens with wide angles yet a little length – making it a good choice for every day use if you don’t need lots of reach. On Amazon this lens has 52 reviews and only 3 of them didn’t give it a perfect score of 5 stars (and two of those gave it 4 stars). I guess it isn’t just DPS readers who love this lens. Nikon 24-70mm f/2.8G ED AF-S Nikkor Wide Angle Zoom Lens – another zoom with a 2.8 aperture and a reasonable focal range. Those recommending it say its sharp, fast focusing and a joy to use. Nikon 10.5mm f/2.8G ED AF DX Fisheye Nikkor Lens – rounding out the Nikon list is a fisheye lens which looks like being a lot of fun. Sigma 10-20mm f/4-5.6 EX DC HSM Lens (Nikon) (also for Canon) – this lens was actually mentioned quite a few times – so many that it only just missed the overall winners list! It looks like a fun wide angle lens to have in your camera bag. Sigma 70-300mm f/4-5.6 DG APO Macro Telephoto Zoom Lens for Canon – (also for Nikon) – this lens certainly has a wide focal range and is certainly on the more economical end of the spectrum of lenses in this category. Pentax SMCP-FA 50mm f/1.4 Lens – again the 50mm lenses pop up. Pentax-m 50mm 1:1.7″ (Asahi) – the Pentax nifty fifty. Olympus 14-54mm f/2.8-3.5 Zuiko ED Digital SLR Lens – The winning Olympus lens with 3 people recommending it. By no means are any of the above lenses complete. There were many other lenses mentioned – but these were the ones which kept coming up again and again in the comments left on the previous post. I hope you find them interesting and useful as you think about your next lens purchase. But looking to upgrade to the 5d Mark iii and reviewing what lenses I what to shoot with. I want to carry less lenses at wedding so looking at the 5D mark iii with 24-70 f2.8 on one day and 70-200 on the other. I mostly photograph portraits (families, kids, etc). However, I want to do more interior/architecture work. As of now I have a Canon 50 mm prime lens and a Canon standard zoom lens 28-135 mm. I don't want to carry around 12 different lenses. I don't mind investing but bang for my buck would be nice. I am a canon user, but would consider Sigma lenses, for example. It seems like I need a wide angle lens, maybe a tilt shift lens and a 85 mm for better portraits. Well that has made my life more difficult. I take weddings and portraits and I would love an 85 L Canon l but I am not that rich yet. Do I choose the 85mm Canon standard or the Canon 100mm Macro????????? I want a great quality prime for portraits. As for the Caon 70 200 L I will go away and talk to the fairies. I love my Nikon Nikon 80-200mm f/2.8D ED AF lens, which you have it on the list above. It's been the best lens purchase I've ever made. Although it's over 10 years old since I purchased it new, it works perfectly. Probably why Nikon still manufactures this version. Jeff, way up there on the comments, is right. The Tokina 11-16mm is an awesome addition to ANY collection. It makes for great nighttime shots, stars shining bright, and great landscapes. I havé bought à tokina 12 24 m for canon after many comparisons on web site and elsewhere. I am very satisfied. Thé Lens IS sharp, thé aperture IS constant and luminous. Thé autofocus IS Right but It doesn't matter so thé manuel mode IS often prefered. Thé range o thé lens IS Right for me for urban architecture and landscape. SorRy for thé tipo With my iPad. Great lenses all of them and I am fortunate to have two of them in my arsenal. However I have other lenses that were not mentioned and it made me remember one of my photography mentors words" People do not remember the gear you shoot with they remember your captures". I have taken some amazing photos with lower end cameras, lenses and other equipment. Once I master all my current equipment I will then and only then get into the L series glass. I am currently a Canon Shooter and must admit they have a huge selection of lower, mid and high end lenses. So to all before you invest in any higher end glass, learn to shoot with that inexpensive 50mm, 1.4. Happy shooting everyone!!!!!! I would love to hear input about favorite lighting and lenses for weddings versus studio. "Sigma 24-70mm f/2.9 OS (do NOT get the earlier, non-OS versions if you want to do sports, as they can be slow to focus)"
The lens doesn't have OS, but does have HSM (hypersonic motor, something like Canon's ultrasonic motor, USM). Your best bet would be to do a search for "Sony 70-200mm review." You may not find very much, as Sony Alpha is not a very popular brand of DSLR. I've seen one in 5 years, vs literally hundreds of Canons and hundreds of Nikons. It would be hard to do a direct comparison between the Sony Alpha lens and the Canon lens. The only meaningful comparisons of lenses are those done on the same camera bodies. That's the only way to compare image quality, focus speed and accuracy, vignetting, etc. Otherwise, all you have is optical specs, like MTF and distortion. More to the point, a comparison would be irrelevant unless you plan to change systems to Canon. It doesn't matter how good (or not good) a lens is if you can't use it. I don't bother reading reviews of Nikon lenses for that reason, since I can't use them on my Canon DSLRs. I don't even bother reading reviews of other brand DSLRs, as I'm not going to switch systems. I have over $17,000 invested in gear that's specific to Canon DSLRs--lenses, extenders, extension tubes, battery grips, custom L-plates, focusing screens, remotes, batteries, dedicated flash, etc--not including the 30D and 50D themselves--plus a Canon 35mm SLR. If I buy another DSLR, it will be a Canon, probably a 7D or 5D. Does anyone on here have experience with the Sony 70-200mm SSM f2.8? I was wondering how it compares to the more popular Canon 70-200 IS that was mentioned in this forum. I own a Sony Alpha and was looking for a good zoom lens for it. Thanks! Good question! The 70-200mm f/2.8 is an excellent lens, especially if you get the IS version. However, it is heavy and VERY expensive. It may also be too long for use indoors with your 40D. (I have a 30D and 50D.) It's also not very good for group shots, unless you're quite far away. Bryan Carnathan has a site, The-Digital-Picture.com, with great reviews of Canon cameras and lenses for those cameras. The site also has lists of recommended lenses for various uses. You can read through the lists and Bryan's commentary to figure out what would be the best choice(s) for you. It may not be just one lens. Be sure to read the introductory articles on focal lengths and maximum aperture. When you figure out which Canon lens(es) might be best for you, also check out Bryan's reviews of lenses from other manufacturers, like Sigma, Tamron, and Tokina. You can also find reviews on retailer's sites, like Adorama, B&H, and Amazon, plus do a search on the name of the lens you're interested in, adding "review," like, "Sigma 24-70mm review." One lens you might consider right away is the Canon 50mm f/1.8 II, the "Nifty Fifty." It's a fast lens--faster than the 70-200mm f/2.8 you mentioned, quite useful indoors, and very inexpensive. The Canon 50mm f/1.4 lens is even faster and has somewhat better image quality, but is also more expensive. One of these would be a good addition for those instances where there's not a lot of light and you don't want to use flash. A wider fast lens is the Sigma 30mm f/1.4. (You can find reviews of all these on Bryan's site.) I own and have used all three, including for indoor horse shows. For outdoor work in good light, the selection is much larger. That's where the extended-range zooms can be very useful--and not too expensive, like the Canon EF-S 18-200mm f/3.5-5.6 IS. (See Bryan's page of links for reviews of EF-S lenses, which can be used only on the APS-C DSLRs, including your 40D. They can't be used on film cameras or the Canon professional cameras like the 1D and 5D series.) Check Bryan's recommendations for General Purpose lenses for other possibilities. wow so much info out there! I like to read the reviews. I have a canon 40d, I'm starting to kick it up a notch. Here is my situation, I love taking candid shots of my granddaughter, portrait shots and outside shots, and family shots of my children and their wives and husbands, flowers, landscape and indoor photos as well. So I'm trying to weed through all of the info on many of the lenses listed. It looks like I need about three lenses. The Canon EF 70-200mm f/2.8L sounds real nice, but not cheap! I'm still reading reviews so maybe this will answer my questions. Can some one offer any suggestions. @rae: If you have not yet made your purchase, for your crop sensor camera, indoor work with moving subjects will require a lens with a wide aperture. Best bet is to look into the Canon EF-S 17-55mm f/2.8 IS USM Lens. It is probably the most expensive EF-S lens made currently, but can do the job extremely well. A favorite among wedding photographers who shoot in similar conditions such as yourself. IS won't help much with the moving subjects though. You can save some money if you can live with a certain focal length. If you can, pick up a prime lens like the Canon EF 28mm f/1.8 USM. On your camera, it will be of a normal field of view and will be even faster than the 17-55 while only costing 1/2 the price. @mick boyd: Unlike other lens types, all true macro/micro lenses are of great quality. I bought a Tokina 100mm macro lens for Canon on eBay last year. Very sharp shots from that lens. Great build quality and the focus ring is fantastic. If you see a macro lens for sale at a good price from you camera manufacturer, Sigma, Tokina, or Tamron, by all means pick it up. You'll love it. Image stabilization is nice to have but not a requirement with most macro work and it often doubles the cost of the lens. I have a Nikon d60,and want to explore the world of macro.Price is a consideration for me,and I have looked at two,being Nikons 105mm f2.8,and Sigmas 105mm f2.8.The Sigma is much cheaper,but is it comparable in quality? I've just received a Canon EOS Rebel T3/ 1100D but have no idea what lens to put on it. I work for a newspaper and previously used a cheap Kodak point and shoot prior, which surprisingly could get semi-decent shots on occasion. However, a problem was I needed something with a faster shutter speed when shooting indoors. An example was shooting a veteran's day program in a dark gym. When I turned of the flash, the images came out too blurry. I practically had to be in someone's face with the flash for a decent shot. Another situation is when working for a small town paper, local politicians like to sign a lot of proclamations- sometimes involving several people, and resulting in the need for a wider angle lens. Thankfully, I don't have to worry about shooting sports photos. i'm going to buy a nikon d7000 soon which has an 18-105 lens already. I like shooting portraits and detailed rather than landscapes do you think i should buy a "nifty 50" too or it's not necessary and the 18-105 will do as good as this? i'm a beginner and dont know much about lenses, so forgive me if my question is funny. The best advice I could give is to think long term when considering lenses and save for quality. I started photography with an EOS 300 twin lens kit - that's film, not digital. The first lens I bought was a 70-200 f4L which I saved up for some time for. I used it on a subsequent holiday and could not believe the difference in clarity, saturation and contrast - same film as used previously and same processor. That was nearly 10 years ago. I still have and use the lens. The f2.8 may get rated higher but I like the weight of the f4. I now have a better camera and 1 other L lens - the 24-105 f4 but I fully expect these lenses to outlast the cameras by some margin and factor that into the purchasing decisions. The non-L lenses I have are the nifty fifty f1.8 and the 85mm f1.8 for my full-frame camera - the f1.2 is somewhat out of reach - but they give amazing shots. The survey was of "Most Popular and Favorite DSLR Lenses," i.e., the lenses most people like, use or want, not the one most people have. Not many serious photographers I know actually use the 18-55mm lens. I certainly don't; mine is in a pouch on a shelf. I have an 15-85mm IS plus the fast 17-55mm f/2.8 IS, among others. In Canon's case, quite a few DSLRs are sold with other lenses (e.g., 28-135, 18-135, 18-200, 24-105 L) or as bodies only. The 18-135 and 18-200 would be better choices than the 18-55. I can't figure out what you're trying to get across. I guess that English is not your native language. Have you tried writing your comment in your language and using Google Translate to translate it into English? I cherished up to you will obtain performed right here. The caricature is tasteful, your authored subject matter stylish. nonetheless, you command get bought an impatience over that you would like be handing over the following. ill indisputably come more beforehand once more as precisely the similar nearly a lot continuously inside of case you defend this hike. I think you have forgotten about the newbies.. most of the first DSLR camera owners have this len - Kit len 18-55mm both for nikon and canon. - personal opinion. Enjoy that honnymoon as for the next lens i would get the 24-70mm f2.8 very nice lens also the 70-200 f2.8 is a very nice lens wildlife and landscape i would get 400mm and 600mm lens they are hi dollar lens but in photography you get what you pay for.But to start with 50mm f1.4 great lens 24-70 70-200 would be great if you can aford it stay with prime lens.I am a freelance photographer have been for over 20 years the lenses i am talking about are very nice lens if your just starting out you wont need any more for awhile learn to use them befor getting anymore and by the way the 60D is a very nice camera i use it myself among others that camera should last you along time if used the wright way photos are as good as any camera learn to use manual settings and for gods sake read the manual thats one of the bigest mistakes people make and when you get a lens read the information you get with it other than that read all you can about photography use sites like this one talk to people in the know and go out and shoot shoot and shoot some more have fun with it good luck enjoy. Just purchased a Canon 60D as my first ever DSLR with a 50mm F1.4 Canon Prime lens as instructed by many people including a Pro Photographer who was my course teacher. I love this lens alot. Has made me appreciate all the aspects of photography. But do feel it time to get another lens, but not sure of what. I take photos of everything from portraites to land scapes. Eventually i will get a macro too. Have been scoping the net for a number of months now and i'm tending to lean towards a Canon 24mm-70mm F2.8 as a good all round lens. Budgeting for no more than $1500 AUS. Got my honeymoon coming up soon so i will be making my purchase very soon. This highly depends on your photographic needs! The Olympus Zuiko 50-200mm f/2.8-3.5 Digital ED SWD is very fast and renders beautiful image quality, sharp throughout the entire image and with minimum distortion and vignetting. Together with E3 this telezoom is very versatile, the fast f-stop and the image stabilizer reduces dramatically the need for carrying a tripod. The focus mechanism is nice, lightning fast and quiet. Build quality seems excellent (although I have not yet tested its splash proofing) Highly recommended! My top 5 are Nikon 16-35 VR, Nikon 24-70, Nikon 105 VR, Nikon 70-200 VR II and Nikon 300 2.8 VR II. That what's makes me use Nikon SLR bodies. My husband and I have invested in Sony, and is having trouble deciding on our next lens. I was hoping there would be something listed here! So far, we only have the kit lens, 50mm f2.8 and macro. We're not able to invest in serious zoom lenses. Any advice? Just wanted to point out that Sony and Minolta were not mentioned. I absolutely LOVE my Canon 100-400mm f/4.5-5.6 L IS. It has incredible reach and the photos are tack sharp. The image stabilization makes it more hand holdable and it is fast enough for most lighting conditions. My personal favorite is Canon 18-55mm, it is wide and gets me very decent shots. OK, it is not a prime lens yet the results are good enough for most of the situations. Sony SAL70400G - almost never leaves my camera. Best overall clarity, detail, color, keep rate. Just amazing! You won't want to put your camera down if you have this one. I understand what you are saying about the macro lens - I have a tri pod and a flash (580EX11) so I will pracitce that. Which lens shoudl I use? On another note I completely forgot to mention I have an 18-135. It came with my 7D. Do you think it will be any use to me? New questions - I want to buy all new filters for my lenses. I would like one to make my photos crisper and more vibrant. It is very sunny where I live during the summer months. What do you think? Click on the link I put in the previous post--it goes right to the Adorama page for the Canon 24-70mm f/2.8L lens. Don't go by local retail prices--check Adorama, B&H and Amazon. "As for the rings if I had a marco would I be able to take them without using a flash and tripod? I work alone and so I will have to work quickly." No. The lens's macro capability wouldn't help. It's a matter of shutter speed. being high enough to counter camera shake. (Really, "photographer shake.") It's very hard to handhold a lens that's focussed very close and get a decent photo. (I've done it enough to know.) To make matters worse, the depth of field (the range of distances in focus) gets shallower as you move in closer. It also gets shallower for larger apertures (lower f-numbers), which you'll need to get the shutter speed up. If you don't have a macro lens, use a lens you have and be ready to crop the image. By backing away from the subject, you'll also get a longer depth of field. If you put the camera on the Trek Pod and hold it with your right hand, you can hold a flash (connected to the 7D by an off-camera cord) in your left hand, off to one side and up, pointing at the rings. You can use a diffuser, as well. The main point is to experiment at home beofe trying anything on a paid shoot. I probably wont be getting a 5D until the end of the season so do you think I should try and sell my 16-35? I paid 1400 for it and it was gentley used. The photographer usually did sports photogrpahy and did the occasional wedding and this lens was just used for a few shots. The 24-70 I thought was about 1800 plus tax? As for the rings if I had a marco would I be able to take them without using a flash and tripod? I work alone and so I will have to work quickly. What would be the best lenses for big group shots? "I have found a barley used 24-70 for 1400 dollars so I think I will purchase that." You can buy a brand-new lens from Adorama for $1399 plus shipping. "If I have the 24-70 do you think I still need to sell my 16-35 to buy the 17-55?" If you're going to get a 5D, the 17-55 won't fit on a full-frame camera. The 16-35 on the 5D will be very wide, like a 10-22 on the 7D. On the other hand, the 17-55 would work well for the 7D backup. IS is nice to have, as well. You pays your money and makes your choice, but I'd say not to get the 17-55, now that you are getting the 24-70. Do some experiments with rings. You can also crop the photos, especially the 18MP images from the 7D. That way, you can back off a bit, which will give you a longer depth of field. You can use a tripod and/or flash to get a smaller aperture, also for better depth of field. Experiment with lighting. I assume that you have a good professional-level flash (or two). Get an off-camera cord (either the Canon cord or one of the cheaper ones from eBay) and learn to use the flash at an angle off the camera. Also, check into A Better Bounce Card This is invaluable for weddings! The inventor is a wedding photographer. There are lots of bounce and diffusion devices available, but these are among the more versatile. You can use it for landscape and portrait mode, as he shows you. He also has a range of sizes, which most do not. Watch his videos: they're corny but very informative. (You can also find his videos on YouTube by searching on "Peter Gregg" or "better bounce card.") Peter has a new site and "store"--the old site may not work for purchases and it may show discontinued items. I would have loved to have bought a 5D or even a 1D. Its on my list and soon the 7D will be my back up camera. I have found a barley used 24-70 for 1400 dollars so I think I will purchase that. If I have the 24-70 do you think I still need to sell my 16-35 to buy the 17-55? The smallest thing I need to photography is wedding rings. For full frame cameras, the standard for wedding photographers is 24-70mm (for most of their shots) plus the 70-200mm. For group shots indoors, they would probably use the 16-35mm. (16mm would give about half again the coverage of a 24mm.) Covering the equivalent range with your 7D would require 15-44mm & 44-125mm. You have 16-35mm, 50mm & 70-200mm, a full-frame equivalent of 26-56mm, 80mm, and 112-320mm. It seems to me that you have a big hole that is, unfortunately, right where many of your shots will probably be. The 50mm on your 7D is like an 80mm lens on a full frame camera, so it doesn't do much. It won't help very much in low light group shots, but it would be helpful in some individual shots. So, as far as I can tell, you probably should do something to fill that gap. If you don't want to spend $1,400-1,500 on a Canon 24-70mm f/2.8L, you might consider a Sigma 24-70mm f/2.8 IF EX DG HSM, for about $900. (Do NOT get the older version that doesn't say, "HSM.") You might also check eBay & Craig's list for used lenses. Another approach, if you will be keeping the 7D, would be to replace the 16-35mm with the Canon 17-55mm f/2.8 IS lens, as it would be the equivalent of 27-88mm on a full-frame camera. You could probably sell the 16-35mm and buy a new 17-55mm for about the same. You'd also have the benefit of a very good IS system. Do you really need "macro" capability? That, by definition, is being able to focus to a distance where the image is at least 1/2 the size of the subject, though most true macro lenses go to 1:1. (A bee would fill the frame on your 7D.) Shooting that close gives you a very shallow depth of field unless you use a very small aperture--f/8-16, which means a lot of light--including a powerful macro flash, or rock-solid support. Figure out what the smallest thing you would need to photograph would be and experiment with the lenses you have. The 16-35mm has a maximum magnification of 0.22x, the 50mm is 0.15x, and your 70-200mm is 0.13x for the non-IS version, 0.17x for the older IS version and 0.21x for the new "Mark II" version. Those might be good enough. The most versatile true macro lens for full-frame Canon cameras is the 100mm f/2.8 USM model (unless you want to spend a lot more for the f/2.8L IS model--$1,049 vs $600). The Canon EF-S 60mm f/2.8 Macro is roughly the equivalent on the 7D of the 100mm lens on a full-frame camera. It's about $460. I am shooting weddings on my own for the first time this summer ( I have done a lot of second shooting) and I am trying to figure out the best lenses to purchase. I have a Canon 7D, a 50 mm 1.4, 70-200 mm 2.8, and a 16-35 plus an external flash. Do you think I need a 24-70? or can I just use those lenses that I have. I have stretched my budget as it is. I will spend the money if I need but I don't want to spend it if it isn't needed. I am also intrested in a good macro lense for the close up details. I don't think my 50 mm is enough for close up details. Any advice would be greatly appreaciated!! I have recently bought a Nikon D7000 body. I want to shoot people, and landscapes. I have already shortlisted 18-200mm lens. Kindly suggest which lens will be the best for close up shots of flowers, insects, butterflies etc.. which very sharp, clourful and vibration free pics? I have quite a few lenses in my case, but the one I find myself constantly returning to is the 70-200mm 2.8 lens. I have the older model without the I.S. feature, and it probably needs to be sent back to Canon for a tune up because the front element has been loose for about 3 years, but I can't go on a job without it! I think the Carl Zeiss line-up for the alpha should be mentioned here, sharpest lenses around. One more tidibit. I won't bore you with the list, but, in the list of the top 100 DSLR lenses, the highest-placing Sony lens (or lens for a Sony camera) is a $199 30mm f/2.8 lens at #96. Here's why. Remember the title of the article: "The MOST POPULAR and Favorite DSLR Lenses." This is the current Amazon bestseller list for DSLR cameras. (Amazon considers each SKU separately, so various lens options count as separate items.) Notice where the first Sony camera comes in. Now, add up (figuratively--they don't give numbers) all 4 versions of the Canon Rebel T2i, all 3 of the T1i, 7D and 60D, and the 2 versions each of the Nikon D90, D5000, and D7000 and it's worse. All told, there are 17 Canon cameras and 11 Nikons out of the 35 cameras, as 5 items are bags or other accessories--4 of which Amazon sold more than any Sony Alpha camera. See the reason that Canon & Nikon lenses dominate the list? I have just been bought my first dslr camera. It isa Sony a300 and I am still getting to know the workings of it. Yes, they are. However, I tried to answer the question meds martin actually asked. 1. Meds specifically asked about the Canon 18-200mm f3.5-5.6 IS, which is in the same general range as the others I mentioned. 2. Meds said that he/she is now using two other lenses with the same general max aperture. 3. Meds said that he/she is taking photos outdoors in bright light--surfing and lifesaving, where those lenses should work well. 4. Meds said that he/she wants one lens with a long zoom range (18-200mm), to avoid having to change lenses and to take on a cruise. There are no long zoom range lenses that are faster. Canon, Sigma, Tamron and Tokina all make f2.8 lenses in the wide-normal range (17-55, 18-50, 17-50, 16-50, respectively), and the 24-70mm and 70-200mm ranges, but nothing that covers 18-200mm. 5. To get a faster lens, meds would have to spend a lot more money. Meds would also have to buy at least two lenses, which is the same situation he/she is already in. Those lenses would be better, but heavier, as well as more expensive, than the 18-200mm lens. George 5.3 6.3 are kinda slow lens. I'd add that the Fotosharp and Op-Tech covers easily fold/crumple up to fit in a pocket. The Kata cover is rather bulky, but provides a lot more protection, as it completely encloses the camera and lens, except for the front of the lens. (Be sure to put a UV or protector filter on the lens!) it rains a lot here (western Oregon), so I usually have a cover with me, just in case. I also bring a fairly heavy-duty plastic bag--e.g., from Staples--to protect the camera even more if it rains hard. I can't USE the camera then, but I'll be heading for cover, anyway! My bags are all from Think Tank and have their own rain covers. Often, the camera gear is a lot better protected than I am! If you decide to buy a lens on the 'net, go to the page above and THEN to B&H, Adorama, Amazon, etc. That way, Bryan (the site owner) will get a small referral fee. I'd also suggest considering a cover for the camera and lens that would help keep the water and sand out. There are lots of covers of different designs. You'll have to look them over and see what might work for you. The cover would snug up around the front of the lens or the hood (if there is one) and cover the lens and camera. Some are open in the back, while others have a clear back so you can see the LCD. Some can stretch over the eyepiece, as well. Go to B&H, Adorama, etc and search on "rain cover." I have a pretty good cover by Kata (E-702 & E-704 extension for my long lenses---e.g., Sigma 120-400mm) and simpler, open-back covers by Fotosharp and the "tube" semi-disposable covers by Op-Tech. The ultimate are the Hydrophobia series by Think Tank and the SportShield series by Aqua Tech, but those are quite expensive. You can also check on eBay--there are some less-expensive models that might work. Hi . I was just wondering what you think of the Canon EF-S 18-200mm F3.5-5.6 IS lens. I have a Canon 400D with the EFS 18-55mm lens and a EF 75-300mm 1:4-5.6 III lens. I usually take photos of lifesaving and surfing so am often on the beach in windy and sandy conditions so do not like to change lenses all the time. I am also going on a cruise ship soon so was thinking of buying a lens that covered wide angle - zoom all in one. any comments? "I came across the Sigma 28-300mm f/3.5-6.3 DG IF Macro Aspherical Lens for Canon SLR Cameras, what is your opinion of this lens I have seen mixed reviews?" Are you familiar with the term, "POS"? If you can't get any other lens, that one might do, but it has serious disadvantages. This was the first lens I got for my 30D after the kit lens. I used it for maybe a month, then put it back in the box and bought a decent lens (Canon 70-200mm f/4L). I loaned the 28-300mm lens to a 4-H member who only had the kit lens for her Rebel, just to let her try different focal lengths. I really don't care if she ever gives it back. 1. **S**L**O**W**! While you get f/3.5 at the very widest setting, it quickly heads for the smaller max aperture as you increase focal length. 2. No IS. This is at a time when nearly all of Canon's consumer telephoto zooms have IS. 3. Worse distortion than most zooms, in part because of the wide range. 5. It's not really that wide on your camera. It's equivalent to 45-480mm on 35mm or full-frame cameras. The 70-200 f/4L, especially the IS version, is actually sharper than the older 70-200 f/2.8L or f/2.8L IS. (The new 70-200 f/2.8L IS II is very good, but it's also $2269!) It's lighter, easier to carry, uses 67mm filters vs 77mm (so they're cheaper). Several reviewers have dubbed the IS version the sharpest zoom of any length by any manufacturer. The zoom mechanism is as smooth as melted butter, as well. If you are planning to shoot outdoors in the day, the f/2.8L is overkill--the only advantage would be more background blurring. I've owned ALL four of Canon's 70-200mm family before the f/2.8L IS II. The f/4L IS is by far my favorite, unless I absolutely need the extra stop--e.g., for indoor horse shows. If you don't want to spend that much, check the comments above (I've written a lot of them) AND the reviews and recommendations at The-Digital-Picture.com. You might consider the Canon EF-S 18-200mm f/3.5-5.6 IS. That lens is about twice the price of the Sigma 28-300mm ($595 vs $300), but it is MUCH better quality, has a good IS system, is much wider, and is faster. It could REPLACE your kit lens, if you got the 18-50mm lens. If you want to spend a bit less, consider the Sigma and Tamron lenses of similar focal length range. See, for example, Bryan's review of the Sigma 18-250mm f/3.5-6.3 DC OS HSM IF lens, as he compares a bunch of lenses with the 18-200+mm range. His first choice is the Canon 18-200mm, with the Sigma 18-250mm second. The Sigma 18-250m is $479 at B&H, only $180 more than the close-to-junk 28-300mm lens. I got the fast primes (f/2 or faster) for indoor horse shows, where even f/2.8 often wasn't fast enough with my 30D. The two long Canon L primes are amazingly good, though not as versatile as the zooms.The 300mm lens is exceptional for flowers, if one can back off enough. The narrower field of view helps eliminate distracting backgrounds. Can anyone suggest best compatible lenses for My Camera. I have been doing photography for about a year now, and have just been using the kit lens purchased with my Canon T1i. I am planning on getting a second lens, any advise on what I should get? I shoot mostly scenery, people and achitecture, dabbling a little bit in micro and portraiture. I would love to get the Canon EF 70-200mm f/2.8L IS USM Telephoto Zoom Lens but the cost is a little more than I want to spend. I came across the Sigma 28-300mm f/3.5-6.3 DG IF Macro Aspherical Lens for Canon SLR Cameras, what is your opinion of this lens I have seen mixed reviews? Here's the link for the Canon 50mm f/1.4. I must have goofed in posting the previous message. Bryan doesn't recommend the Sigma lens because of frequent inaccurate autofocus. It's also by far the most expensive of the three. Why would you want any of these? The main advantage they all have over the kit lens is their speed. The f/1.4 lenses are 4 stops faster than the kit lens (f/5.6 @ 50mm). They're more useful in low light (indoors, dusk, etc) and will give better "bokeh" (the out-of-focus blurring of the background that helps isolate and emphasize what is in focus) than the kit lens. Outdoors, in reasonable light, they're not going to be much better. They're not IS lenses, either. Don't get me wrong: they can be very useful. I have both the Canon f/1.4 and f/1.8--both because I bought the f/1.8 first. For MY uses--primarily indoor horse shows, they are very useful, as I need a fast shutter speed to stop the motion. I usually use f/2. The f/1.4 lens focuses faster than the f/1.8. Depending upon what you want to do, you might be better off spending the $100 on the f/1.8 lens and then getting a longer zoom. I have been doing photography for about a year now, and have just been using the kit lens purchased with my Canon 450D. I was looking into getting the Canon 50mm f/1.8 lens, but have been reading about the f/1.4 and was wondering which you recommend (if money is no option)? I was looking into getting the f/1.8, being cheaper, but was told it has bad ghosting and refractions at night ans is a poor build quality. It was also suggested that I look into getting a Sigma 50mm f/1.4 EX DG HSM instead. In order of purchase date, have the Canon 100mm f/2.8 Macro, 28-135 f/3.5-5.6, 24-70 f/2.8 L and the 70-200 f.2.8 L II lenses, along with the 2x Mark II TC. Of these, my favorite are my two L lenses - and ironically, my most used lens is the 24-70, but my favorite is the 70-200. The 100mm macro sees use only when I am shooting macro, which is rare, and the 28-135 has been retired since I got the L lenses. The TC sees use only when I am doing wildlife photography or the like, and even then it's usually better to just use the 70-200 at 200mm, but it has really surprised me with how good it is when paired with the 70-200 and I use a tripod, cable release, mirror lock up, careful focusing and image stabilization. Those two L lenses cover 98% of what I shoot, and that includes weddings, portraits, landscapes, insurance, advertising, artwork, surfing, pets, stock, wildlife and commercial photography. I am surprised they aren't ranked #1 and #2 in popularity for Canon, respectively. I'm looking for a very sharp lens for making copies of my paintings. I'm using a nikon F3 and thinking of getting a second hand Nikkor 55mm f1.2 AI, its moderately cheaper than the 50mm 1.2 but was told it's almost as good. I'd be grateful for any opinions on this. I thought the 50mm F1.8 would be great but the camera store guy said it wouldn't work with my camera, I think because it wouldn't be fast enough, manual focus, trying to shoot constantly through dances to catch all the moments? What would be a good lens for this application that is reasonably priced? May anyone tell me relation between focal length and zoom of a lens? Sigma 27-70 2.8 Thats the way to go...if you have no money. I'm saving for the Cannon 70-200 2.8 though. @Michelle: I recommend the Canon 50mm f 1.8 or the f 1.4. They have a W I D E aperture. Your needs may lead you toward either a wider or longer lens, though. On your XS, the 50mm lenses have the same field of view as an 80mm lens would on a 35mm or full-frame camera. That's a "mild telephoto" or "portrait" length, but it's still very useful. However, if you want to do low-light photography indoors of groups, you may need a wider lens. Canon makes several, as does Sigma. Among the Canon lenses, the venerable 35mm f/2 can work very well, as do the 28mm f/2.8 and 24mm f/2.8. If you need an even faster lens and can afford the cost, the Canon 28mm f/1.8 and Sigma 30mm f/1.4 might fit the bill. I also use the Sigma 30mm f/1.4 for horse shows if I'm quite close to the action. If you need a fast zoom lens, be prepared to spend a lot more and get a slower aperture. Canon has f/2.8 zoom lenses covering 16mm to 200mm, but they're expensive and not as fast as the primes. For your XS, the Canon 17-55mm f/2.8 IS is a faster, sharper, superior replacement for the usual 18-55mm kit lens, but it's $1,060 new. It's the lens I keep on my 30D. Canon also makes the 16-35mm f/2.8L, 24-70mm f/2.8L, and the very useful 70-200mm f/2.8L, which has both IS and non-IS versions. Sigma also makes f/2.8 lenses for Canon cameras that are cheaper, but may or may not be of comparable quality to the Canon lenses. Below is a list of some possible fast prime lenses. The lens name links to a review by Bryan Carathan, the best reviewer of Canon cameras & lenses I have found. Beside the lens name is the current price at B&H. (Please link to B&H, Adorama, etc through the links on Bryan's reviews. That won't raise your cost, but he will get a small fee from the seller.) You can also check eBay and other sources for used lenses. I have a Canon Rebel XS and am looking for a good and not too expensive large aperture lens. Any recommendations? Paul will have his own suggestions & recommendations, but it will really depend upon what you're doing and what body you're using. For full-frame bodies, the 24-70mm f/2.8L would be a good "partner" to the 70-200mm f/2.8L IS II. If you need to go wider, the 16-35mm f/2.8L would work. For a 1.6 "crop factor" body (7D, xxD, Rebels), the 24-70mm will frame like a 38-112mm on a full-frame body. That's not terribly wide. A good partner on a 1.6x body could be the 17-55mm f./2.8 IS, which frames like 27-88mm. It's not an "L" lens, but it performs as well or better than the 16-35mm and 24-70mm. There would be a gap between 55mm and 70mm, but that's not usually a problem if you can move back and forth a bit. (Also, one can "simulate" the 70mm framing by cropping the image at 55mm. However, one CANNOT do the same to make the view wider.) The IS on the 17-55mm lens is quite good and can make the images even sharper in low light. Hi Paul, your right stunning images. I assume these were taken with the Canon Ef 70-200 F2.8L IS mk II, but what body are you using? can you suggest another lens to partner it? For alround performance I would say the Canon Ef 70-200 F2.8L IS mk II is now the best lens I have ever owned. The image quality is so sharp and the depth of field is fantastic. Low light performance is second to none. When shooting weddings in low lit churches this lens will handle everything you can throw at it. i am planning to get my first lens for my sony a330 (i have been practicing with the regular 18-55 lens) any advise on what i should get??? i shoot mostly scenery, people and achitecture, dabbling a little bit in micro and portraiture. i have read that an 18-200 is good for with this i can shoot wide angle and micro shots - true??? also what is a telephoto lens? and is a wide angle lens a good to invest on for landscape and scenery pics?? Tamron 28 - 75 f/2.8 - this was my primary lens but I found I took many many shots at the 28 to 40 mm end of the range so I decided to switch to a 17- 55 as that range covers the majority of my shots. Also, the Tamron was not very sharp until you stopped down to f/4 and it had focussing problems in low light. Thank you so much for the info. I was afraid if those prices!!! Points well made, especially that it isn't primarily the camera that is responsible for great images. Some photographers like to mess around with the Holga medium format (120) film camera. They cost $20-50, are fixed focus or zone focus, have at most 2 f-stops, fixed shutter speed, and are noted for their distortion & vignetting. for years i do alot offreelance work for major mags belive me canon does not take a back seat to anyone. Nikon has some nice cameras and nice lens canon on the other hand has more lenses which is a good thing. I'm not up on Nikon gear, but I do a lot of indoor & outdoor horse show photos. A horse's legs can move even faster than a person's, so I'm well familiar with your problem. For indoor (and even outdoor) sports photography, you should have a lens with at least a f/2.8 aperture through the entire range. Your Tamron lens probably reaches f/5.6 (or even f/6.3) well before 200mm. f/2.8 is TWO stops faster than f/5.6, even more so vs f/6.3. If you get 1/100 sec at f/5.6, at f/2.8, you'd get 1/400 sec. That is a HUGE difference. VR (Vibration Reduction) doesn't help much with sports photography, as the moving subjects require at least as high shutter speed as camera shake would. VR (IS for Canon lenses) IS useful, overall, but it adds a lot to the cost of the lens. If you need to get even faster than f/2.8, the only way to go would be with prime lenses (fixed focal length). I used to have a Canon 70-200mm f/2.8L IS (it was stolen) and still have a 17-55mm f/2.8 IS, but I supplemented those with various prime lenses: Sigma 30mm f/1.4 and Canon 35mm f/2, 50mm f/1.4, 85mm f/1.8, and 100mm f/2. (f/2 is a stop faster than f/2.8; f/1.4 is two stops faster.) In truth, I got most of the primes BEFORE the 70-200mm f/2.8L IS and now am back to using them all the time. I've considered getting a Canon 135mm f/2L, but should replace the 70-200m f/2.8L IS first. You can check what prime lenses are available for your camera. Which might be useful depends upon your situation. I have a Nikon D80 and own the 18-55mm kit lens and added the Tamron AF 28-300mm f/3.5-6.3 VC. The zoom lens works great in daylight but had trouble at dusk and indoors at the long zoom. I take a lot of sports photography (amateur) and find myself changing settings such as ISO, WB, shooting mode, etc constantly to compensate for this. Right now I'm shooting lacrosse which is very fast moving. Indoors is a problem also. I do not have a flash. I have inherited a few Nikon film lenses with conversion rings... Nikkor-Q f/4 200mm, Nikkor f/2.8 24mm, Nikkor f/1.4 50mm all manual focus and manual shooting mode. I don't have a lot of money but if you let me know what I should wish for maybe I can either save up or look for used equipment. I want to make smart buying choices. Thanks for any input!!! *Circular only on full-frame cameras; your D50 would get only part of the image. It might have rounded corners. Also, autofocus probably wouldn't work. That should say that it's not cheap to make a high-quality fisheye lens for the smaller sensors like the one on your D50 (and the one on my Canon 30D). I doubt that your auxiliary lens cost anywhere near $650-1000. You didn't say what brand converter lens you're using. Many are cheap and poorly-made and can cause distortion, chromatic aberration, and other problems and are often quite soft, especially on the edges, as you've found. There are a few fairly good brands, like Raynox (I have 3 Raynox converters for my Canon S3 IS), but they tend to cost at least $100, often more. If you got a cheap lens (e.g., on eBay), don't expect much. I'd be especially suspicious of a "0.45x" converter lens, as very wide-angle converters are usually pretty bad. Lensmate has several pages (e.g., Canon S3/S5, Canon G7/G9) with examples using wide-angle converters, but the widest they go is 0.66x. So, the simple answer is, "Live with it." There's probably not much you can do. I purchased an attachment for my 18-55mm lens for my Nikon D50. It's a "SUPER 0.45X WIDE ANGLE" lens that simply scews directly to my original lens, giving me a full wide angle view of my picture, at the same time I can easily set it for a "Fish Eye" effect. HOW CAN I PREVENT THE EDGES FROM BECOMING FUZZY or BLURRED? i wanna ask, does Nikon 50mm f/1.8D lens compatible with nikon d3000. If you can aford it prim lens are the better lens to use.But if you cant aford prims buy what youcan any of the is lens i would recommend if you do not have a trypod buy the way if you dont have a good trypod i would recommend getting one of those as well.Just do your rearch and buy what you can aford.And read your manual just a reminder. Have fun and enjoy. Thanks for the breakdown. Super helpful! You need to have the details (f) of all the different lenses and the type of lens. Have a look in the forums - that's the best place to ask. HI.If someone can help me to understan the real difference betveen Nikkor 18-200 which I have and 70-300 with f2.8.and nikkor 300mm.which one is the best for shooting weddigs but from distance. Its not 58mm its 85mm sorry. know how to use them forget.Learn to use manual settings. I would like to add the wonderful Tamron 17-50 Di on the NIkon mount. This combined with my D300 are an event dream come true. I gree with the results - the EF 70-200mm f/2.8 L IS is simply the best there is. I would have added my 2c worth if I was in time! hello!!! can anyone tell me that which camera i should buy for studio and outdoor work my budget is 500/600 $. which camera is best. Model or whatever thanks..!!! Bad spelling its new not nwe sorry. Has anyone tryed the nwe sigma 10-20 mm lens . Wondering how it would be in low light concert setings. I'm a pro and use L glass, but I'm also seeing more and more amateurs using L glass. Yes, some of them can be expensive, but the 70-200 f2.8 L IS isn't THAT much when you consider it will outlast the body it's attached to by a long way. These were the most popular lenses, not necessarily the most widely-owned. As evidence, note that none of the usual "kit" lenses included with consumer, even "prosumer" Canon cameras is included. (I know nothing about Nikon gear.) The Rebels (xxxD) usually come with the 18-55mm f/3.5-5.6 IS. The 50D can come with the 17-85mm f/4-5.6 IS, 18-200mm f/3.5-5.6 IS or 28-135mm f/3.5-5.6 IS. The new 7D can come with the 28-135mm lens. Only the full-frame 5D might come with one of the top Canon lenses, the 24-105mm f/4L IS, but that package is $3500, decidedly NON-consumer. It's possible that some of the 233 readers who voted (a small sample) may not even own a lens they voted for. The 70-200mm f/2.8L IS, for example, is a workhorse for sports photographers and others and is probably on the "wish list" for many people, especially those struggling along with mid-to-tele zooms that are f/5.6-6.3 at the top end. The same can be said of the 24-70mm f/2.8L, probably the favorite lens for wedding photographers who use Canon cameras, plus an adjunct for sports photographers, another that's probably on a lot of wish lists. The #3 most popular lens, the Canon 50mm f/1.8 II, is also Canon's cheapest lens ($110 at B&H for the "USA" version). Many people call it the "Nifty Fifty," as it has a wide range of uses, even on Canon's 1.6x bodies (Rebels, XXD, & 7D), where it has the same framing as an 80mm lens on a full-frame/35mm camera. It's usually the first or second "extra" lens I'd recommend, depending upon what the person starts with. For example, if he/she got the 18-55mm kit lens, then a decent mid-tele zoom with IS would be in order, which one depending upon the person's budget. For example, the EF-S 55-250mm f/4-5.6 IS is $255, the 28-135mm f/3.5-5.6 IS USM (better quality) is $390. Second would be a fast mid-length prime, like the Nifty Fifty or the 50mm f/1.4 ($400) if one can afford it, unless the person will be shooting a lot of indoor available light shots of groups, where the venerable Canon 35mm f/.2 ($320) or the Sigma 30mm f/1.4 ($439) might be better. I found it quite surprising to find that many lenses from the L/Pro/ED league on a list of favourites of this site, which is aimed at the "semi experienced" camera owner. Jonathan wrote, "I’ll have one of those 70-300mm canons thanks." Canon does make a 70-300mm lens. If you'd like one, use this link to go to B&H. They'll be glad to send you one for $549 with free shipping. This lens repaced Canon's 75-300mm lens, which I've read was the first Canon lens to have image stabilization. If you're serious photographer, avoid the first (cheapest) one. Spend another $50 and get the second, at least. It's much better quality. The first lens is the successor to the cheap one got with a Rebel 2000 9 years ago, though I probably paid more for it than I should have. It often came, as mine did, packaged with a Sigma 28-70mm 28-80mm lens. That was a good range for 35mm film cameras, but wouldn't be really "wide" for most Canon DSLRs (Rebels, xxD, 7D). I'll have one of those 70-300mm canons thanks. Just post it to my home address. cheers dps! You raise a good question. Go to The-Digital-Picture.Com and read Bryan Carnathan's reviews of each lens. He also has a section with recommendations for various uses. Read the article on Canon General Purpose Lens Recommendations. I've also uploaded some examples with the 17-55mm f2.8 IS of similar topics (nature). I don't have the 17-40mm f/4L, so I can't give examples with it. Why do I have both lenses? Good question. The answer is the same as for why I have both the 70-200mm f/4L IS and the 70-200 f/2.8L IS, plus a slew of fairly-fast primes (Canon 35mm f/2, 50mm f/1.4, 85mm f/1.8, and 100mm f/2, plus Sigma 30mm f/1.4). I mostly do two types of photos: horses and equestrian events on one hand and nature (flowers, plants, birds, insects, etc) on the other. These are not very compatible in requirements. Photographing horse shows (often in indoor arenas) requires fast shutter speeds, so faster lenses are a necessity. I usually carry the two f/2.8 zooms, one or two primes (e.g., 35mm & 85mm) and a camcorder. I started with the 17-85mm & 70-200mm f/4L IS, but they just didn't work. I first got the primes, then the f/2.8 zooms. When I'm walking through the woods, I don't want to carry 118 lbs of gear, plus I may shoot more distant and/or smaller subjects (e.g., birds), so I carry the 100-400mm f/4.5-5.6L IS behemoth, 17-85mm (a better match than the 17-55mm in focal length) and often the 100mm macro and/or Sigma 10-20m f/4-5.6, plus 1.4x extender and 12mm extension tube. To lighten the load, I carry the 70-200mm f/4L IS instead of the 100-400mm and a Canon 250D close-up lens instead of the macro lens. That limits distant shots, but it can work, especially with the extender and extension tube. Do I need all those lenses? Of course not. I could do just fine with the two f/2.8 zooms, 100-400mm, 100mm macro, and probably the 85mm f/1.8 (the prime I use the most at horse shows). However, I accumulated the lenses along the way. Someday, I may pare down, but, for now, all those lenses are useful. I have the Sigma 10-20 and it is a great lens. I also have a cheap Sigma 70-300 f4/5.6 DL Macro Super II and it is as sharp as any 70-300 I've seen. I originally bought it for my wife's 35mm SLR, but it works so good on my Sony a100 that I won't give it back to her. ok, now i'm confused. i'm looking to upgrade my 'kit' 18-55mm on my 350D, and initially reckoned the Canon EFS 17-85mm f4-5.6 IS USM (ZAR 6,200) would be a good bet. but i've noticed mixed feelings about this lens - some love it, while others reckon it is rubbish. (ZAR 11,800), which seems to be the undisputed king - but these are pushing my financial boundaries a bit. I was able to buy and have had a great deal of satisfaction with a new Canon 17 - 85mm lense. I was particularly interested in the wide angle option for panorama photos while traveling in Peru and Cambodia. I'm new in DSRL photography. Most doing family events, vacations and ect. So I'm looking upgrade my Cannon lens that was come with the camera. So now a lot Ritz camera stores are closing and I have seen there Quantaray 18-200 mm DC 3.5-6.3 Lens f/Canon DSLR can get for $150. So What is your opinion? david h wrote: "I cannot believe the Canon 16-35mm f/2.8L didn’t make the cut." Perhaps because it's not as popular. "IT eclipses the 17-40mm in almost every aspect." It sure does, including in weight (22.6 oz vs 17.5 oz), size (4.4"L x 3.5"D vs 3.8"L x 3.3"D), filter size (82mm vs 77mm) and especially price ($1450 vs $700). The 82mm filter size adds to the cost difference, as well. For example, using Hoya HMC filters, UV + CPL filters would be $49 + $170 = $219 for 77mm, $63 + $262 = $325 for 82mm. (Other brands/types will give different numbers, but in the same order.) Yes, the 16-35mm has better quality, but, is it worth more than twice the price? For some people, yes, but not for many of us. For the great majority of Canon DSLR owners who have 1.6x cameras, there's also the Canon 17-55mm f/2.8 IS for $1030. It's about the same size and weight as the 16-35mm f/2.8L, has a wider range and has IS. It doesn't have as good build quality nor quite as good image quality, but, for what I do, it's a better choice. I cannot believe the Canon 16-35mm f/2.8L didn't make the cut. IT eclipses the 17-40mm in almost every aspect. For those wishing to purchase Canon 16-35mm f/2.8L, don't get carried away by the result, it is one of the best landscape lenses I've used so far (apart from Tilt shifts). Perhaps that's because Sony is 'way behind Canon & Nikon (and probably others) in sales of SLRs. This survey was, after all, of the most POPULAR lenses, so it would be natural that most are for Canon or Nikon cameras. One thing that I've noted in reading the missives here is that many of us think that OUR favorite lens must, perforce, be everyone's favorite, too. We may forget that other people have different interests that will influence their choice. If you're a bird photographer and can't afford the gorgeous Canon 500mm f/4L IS ($5800), you may settle for the Canon 100-400mm f/4.5-5.6L IS ($1460) or one of the Sigma supertele zooms (e.g., 150-500mm f/5-6.3 OS, $879, or 120-400mm f/4.5-5.6 OS, $749), plus a 1.4x teleconverter. It's slow, and, with the teleconverter, you lose autofocus on all but 1-series cameras, but it's a lot less than $5800. On the other hand, if you shoot landscapes, you can get by with slower (also cheaper & lighter) but sharp lenses like the Canon 70-200mm f/4L. If you hike a lot, you may appreciate a fairly lightweight "all-in-one" lens with image stabilization (e.g., Canon 18-200mm f/3.5-5.6 IS, Tamron 18-270mm VC), even though it may not be as high quality or as fast as heavier lenses. For "walking around," with a 1.6x (APS-C) camera (Digital Rebels, 20D-50D), you may like the 17-85mm f/4-5.6 IS, 17-55mm f/2.8 IS, or others in that range. If you're on a strict budget, the IS version of the 18-55mm lens ($140) can work out really well. Funny thing that Sony didn't make it up to the top. I use the 16-105mm f3.5-5.6. It's not specialy fast but is an excelent lens for every day use. On the other hand I have a Minolta 50mm f1.7, a lovely piece of glass when there's not enough light and you still want a sharp portrait without a tripod. Thanks so much for the advice. The websites you recommended will be of tremendous help to me and to my daughter. Currently she does most of her shooting outdoors, but that is really due to her lack of good equipment. Her real interests lie in hockey and advertising (including people, products, studio and location). We have already purchased a flash and the 50mm f/1.8 but I do think that I will talk to her about what she thinks that she will need the most. There is always the next holiday for the next lens! Thanks again! The two uses you cite could be diametrically opposite, depending upon what sort of "advertising" photography she would be doing: people, action, products, etc., and could have very different requirements. The "right" sports lens would depend upon what sort of sports she would be doing--indoor (hockey, basketball) vs outdoor (baseball, football); field (where the players and action move significant distances) vs relatively fixed (e.g., golf, tennis); fast (a tennis racquet moves very fast) vs slow (golf, . If she's doing baskeball from up close, she might need a 24-70mm f/2.8, whereas, if she's shooting football, she'd need a much longer lens--70-200mm, minimum. Advertising photography could also require a fast lens, mostly for the "background blurring" effect of shallow depth of focus, but it would also depend upon the precise sort of photography she would be doing. She would be the best judge of that. As for getting a cheap lens, with the idea of moving up, that can work, but it will be more expensive in the long run. Canon L lenses hold their value well--check them on eBay to see this, but the cheaper lenses do not. Also, "cheap" usually means "slow," especially in zoom lenses, which could seriously limit their usefulness. She might even be better off with a couple of fast primes, rather than a slow zoom, like the 35mm f/2; 50mm f/1.8 (which she should have, in any case, as it's really cheap); 85mm f/1.8 or 100mm f/2--or even the 100mm f/2.8 Macro (which, though a stop slower, would open up many other aspects); 135mm f/2.8; or 200mm f/2.8. The 100mm f/2.8 Macro is under $500, the 200mm f/2.8L is about $700, but the others are all $400 or less. Again, she would probably be the best judge of what to get. I'd recommend that you check out Bryan Carnathan's reviews of lenses. Bryan understands sports photography quite well. I'd also strongly recommend Harry How's videos on YouTube. (There are three parts to the series.) How is a well-known sports photographer. In the videos, he goes over the equipment he uses and some tips for aspiring sports photographers. My daughter is a photojournalism student currently shooting with a Canon XTi. She will be upgrading to a Canon 40D this summer. We would like to suprise her with a new lens but I am not sure what to get. She is most interested in sports photography and advertising photography. We would like to get her something that works in either or both of these fields. While it would be great to be able to get her a top of the line lens, tuition payments preclude that. But advice on all lenses would be appreciated, we might be able to help her with those higher priced ones after graduation! Thanks in advance for any help. I have read many very positive reviews on the Tamron 17-50 2.8 and the Tamron 70-200 macro, the guy in the camerashop where I bought the first also said it was a very good choice. I'm surprised not to see it in the list of others, but at the other hand, just over 300 responses is not that much. Interesting list though! To add a bit to my earlier (long!) post: Another aspect of super-wide angle (short focal length) lenses is long depth of focus at the same distance and aperture. That can come in handy or it can be a curse. This is why it's often difficult to get good "blurring" of the background with point-and-shoot cameras, which have very short focal lengths. Here's an example of an "up-close-and-personal" shot with a super-wide-angle (Sigma 10-22mm, set at 10mm). You can see the rounded perspective, which came from being only a few inches from the foreground object (a rotting apple) and the relatively long depth of focus. To get the same framing with a 50mm lens, I would have had to be 5 times as far away--2+ feet, instead of 4-6 inches. With a 200mm lens, it would be 20 times as far, about 7 feet. The images would be the SAME size (that's what "same framing" means), but the perspective would be much shallower. (I would have also had to elevate the camera a bit, as it was pointing slightly down.) One of these days, I'll do that sort of comparison. I'm surprised the Nikon faithful haven't been pimpin' the 85mm 1.4 D, it seems every Nikon shooter drools over it. I'd vote to add the Nikon 14-24mm f/2.8. It's so lusted after that the folks over at http://16-9.net/ have a neat article of mounting that lens on a 1Ds Mk III. I'm saving up to get one myself, for landscape shots. For cubsfan7: It will very much depend upon what you want to do and how much you want to spend. A lens that goes down to 17-18mm would be a "wide angle" on your 40D, like my 30D, the equivalent of about 28mm on a 35mm or full-frame camera. The 18-55mm kit lens is actually pretty good, though not very fast. If you want to go a step up from that, you have to decide if you want to go to the expense (and weight!) of the fast lenses, including the "L" lenses, want something wider (shorter focal length), with image stabilization, and/or a wider zoom range. Here are some suggestions. Instead of giving a description, I've included links to Bryan Carnathan's reviews where I could. Another possibility for an "ultra-wide" lens would be the Sigma 10-20mm f/4.5-5.6 EX DG HSM lens, which I have. It's a bit cheaper than the Canon 10-22mm and acceptable. The main advantage of the Canon lens has less barrel distortion at the short focal lengths. (It is also a slight bit faster.) That distortion could be annoying if you do a lot of architectural photos. (Vertical edges of buildings will seem to bow out in the middle.) It's much less a problem if you do nature photography, for example, as I do. You can correct some of the distortion with software. Very wide-angle lenses are also problematic if you're taking photos of people, other than big crowds. In order to "fill the frame" with a person, you'll have to get VERY close, which is a perspective that we're not used to seeing. (The focal length of a lens does NOT affect the perspective; that's a function only of the relative location of the camera and subject.) This can result in huge-appearing noses and a "looming" feeling. Even indoors, it's best not to use a lens much wider than a 50mm equivalent--for the 40D, that would be 31mm, so 28-35mm would work. Were ultra-wide lenses come into their own are architectural shots and getting "up close and personal" with a subject, where you actually WANT the very "round" perspective. (I'm not talking about macro photography, which magnifies the image. Ultra-wides actually reduce the size of the image.) Architectural images (interior or exerior) would require a low-distortion lens and/or a "tilt-shift" lens, which can be quite expensive (and does not autofocus). Did your 40D come with the 24-105mm f/4 L IS lens or one of the less-expensive EF-S lenses (e.g., 18-55mm f/3.5-5.6 IS or 17-85mm f/4-5.6 IS or perhaps the 18-200mm f/3.5-5.6 IS)? If the latter, here's a suggestion. Try experimenting with that lens at the widest (shortest) setting--17mm or 18mm. That is actually within the range of the ultra-wide lenses. Try getting up close to subjects and checking the perspective (not by looking through the lens, but taking a picture; our brains interpret a flat, 2-D image differently than even a one-eye image). If that intrigues you and you want to go further, consider the Canon 10-22mm (especially if you want to do architectural shots) or Sigma 10-20mm. It can be fun to experiment. I have the prime (fixed focal length) lenses because they are faster than the zooms--and actually cheaper. (The three primes cost, used, less than the 17-55mm f/2.8 IS lens does new.) I have considered getting the 17-55mm f/2.8 IS lens and selling the 24mm. I am looking for a wide angle lens for my Canon 40D any suggestions? This will be my first wide angle lens and I don't know what to look for! I concur. I posess three of the top five: #'s 1,4, & 5 and six of the top ten Canon's: #'s 1,3,4,5,8 & 10. Looking to purchase the 16-35mm f/2.8 II to complete my wedding/event gear bag. I think the fisheye would be a great addition as well. I like the Nikon 50mm 1.8 lens, but it is a problem focusing, especially in the dark, if you have a D40, which can't autofocus with this lens. The "green dot" that guides the focus really does not work that well. I have "focused" the lens up and down a fair amount and the green dot stay lit. Thus using the green dot to focus is rather inexact. A wide variety of focuses are "correct", according to the green dot. I had a Nikon film camera with a similar lens with a split lens focus. All you had to do was to find a straight line in the scene you were focusing on, then match one half of the line to the other half, and you were perfectly focused. No guessing! Why did Nikon give this up in favor of multiple guess focusing?? Anyone know? Since U have completely discarded the Tamron 18 - 250 f 3.5 - 6.3 Di II has the topclass review by so many Long Time proffessionals & U have given a place for the Sigma wide lens I don't know what to say. It is better I skip Ur articals before my brain gets damaged. I wish to say that I was a stanch Sigma freak, used to hate Tamron. In the process I had all that fungus problems within no time, mainly it is nowhere sharper than Tamro lenses & that made me a so so photographer in my community & friends circle. I still have my Tamron 70 - 300 LD (not very good or the best) that I had used in my Nikon F100 with good results. But it is much better than the Sigma equalent. Now I have a Nikon D 80 & the New Tamron 18 -270. It certainly has some small con points like Zoom creep. The focal ring movement is a little un even. It is cheaper than Nikon 18 -200 & the result is almost nikon Sharp. So I feel the verdict is in correct. Thank U.
I'd add Minolta 80-200 f/2.8 G HS which was surpassing any other lense in these categories when it was launched, and the Minolta 28-70 f/2.8 G which is providing fantastic sharp pictures with nice colour cast. The 10-20mm is so versatile it rocks a lot! I'm just a rookie and got the nikkor 50 mm f/1.8 and the results were amazing. potraits and candids of my young kids turn out soooooooo crisp. the best $ 100 ive spent. Lucas: i've got a huge suggestion of Olympus lenses that are pin sharp. Old school OM film primes. Laugh, but because of a whole bunch of Canon shooters (only Canon and Four Thirds for technical reasons. won't mount on any other mounts without losing infinity), the prices for Olympus OM Primes have gone up. Even better that it works perfectly out of the box on brand spanking new Pentax DSLRs without adapters. It is interesting that there is a Pentax M series lens in the list (that lens went out of production in 1984). I just got the tokina 11-16mm f2.8 for my dx camera nikon d300 and it is absolutely fantastic. Had to order it and it took 3 months to come in but it was worth the wait. This is kinda stupid. Why both with the manufacturer of the lens? A 70-200 IS or VR or whatever is still going to be at the same "popularity" level no matter the maker of the camera body. It's interesting... but dumb at the same time. 28-105mm Sigma-50-150mm,Tamron200-5oomm.This apart I have Micro Nikor lense-200mm,Sigma 150mm,Tokina100mm,Nikor60mmAfs. Prime lenses Nikor-50mm,35mm,20mm,10.5mm Fish eye ,Nikon T.S,Micro85mm.All lenses have specific utility.Reviews by your photographers are interesting. A nice list indeed... Totally up for a 70-200 f2.8 for music shooting - one day!!.. Well, it's seems there's no Olympus user around because there are some Olympus lenses that I would have mentioned because they are extraordinary. This is an unbelievable sharp makro lens which is also perfect for portrait photography. It's sharpness outraces the actual (Olympus) sensors. DPreview votes this as one of the best lenses that is available at all and I can agree. Also amazing 5x zoom lens which is quick and sharp. This was also voted as one of the best standard zooms currently available. I dream about Canon EF 70-200mm f/2.8L IS but it is too expensive for me :( So I am looking at Sigma 70-200 f/2.8. I'm a paparazzi, I'd have to say the 70-200 2.8 and the 16-35 2.8 are my favorites. The 16-35 isn't to widely used by us, Only maybe 10 out of a few hundred use it. But the 70-200 is used by every well established paparazzi I come across. I love them both though. The image quality is fantastic and it increases the value of my pictures. The lenses have already paid for themselves. I'm supprised the sigma 30mm F1.4 did not make the list. For everyone shooting a cropped sensor camera this is the perfect prime lens. I guess being new it is still early days, and it is not the cheapest lens out there. I have recently purchased it and am sellng my canon o nifty fifty (F1.8) which is a great lens but with the cropped sensor is just not wide enough for indoor work. Good list but as someone else mentioned above the results aren't really that surprising. 1. Canon is far more popular than Nikon (I use Nikon so no, I'm not singing the praises of one over the other). Just look at the numbers. 2. Naturally the fast 2.8 Canon/Nikon lenses are going to be the favourites - there simply isn't anything that can match them (I used to have a Canon 24-70mm f2.8L and it is still my favourite lens despite changing to Nikon kit this year). The best part of this list is finding out what the focal ranges are on peoples' lenses - that info is very useful. #1 shows how many pros read your mailing list. I will get myself a 50mm (Canon) tomorrow (#3)the first lens after my kit one, just starting out and do not have much money to dump into this as I'd like yet. Does getting a Canon EF 2X II Extender make the 50mm a automatic 100mm or 140-400 in the case of #1 on your list? Just thinking my way to getting good results with what I have to generate more funds for items on this list. Awesome list anyways! Thanks for doing this. While not a comprehensive list (don't know why people say such and such should be there or what about such and such), it is a very interesting exercise and should be taken as a list of lenses to consider if one meets your needs. And remember, only 302 people responded. I've got #1, #5 and #10 on the canon list and don't regret any of them (although the price of the 70-200 IS slowed the purchase of the next one). I had a sigma 70-200 F2.8 EX DG HSM but it had troubles communicating with the camera (50D) and kept floating through front focus amounts requiring constant (hourly sometimes) adjustment with micro focus adjustment in camera. So away it went traded in on the Canon 70-200 IS. Henry's is an excellent company/store. They have treated me well above my expectations. I just bought a used Tamron 24-105 F/2.8. The lens is so much clearer than the canon lens that came with my camera. It's fast and clear. It is heavy but it's worth the extra weight. I like my 12-24 Tokina the best. Sharp. As a somewhat newcomer to Digital SLR photography this listing of lenses was very interesting. I purchase a 2nd hand Sigma 28-300mm Macro from a member of my local Camera club. To be quite honest I've not taken it off since as it covers everything I want to take. It was especially useful while on holiday in Alicante this year with my family & Grandson. "Nikon 70-200mm f/2.8G ED-IF AF-S VR Zoom Nikkor Lens - this lens has had some great reviews and is renowned for being a high quality camera." Great little list. Technical reviews are great to read, but it's always good to see what the popular vote is for lenses. Especially now - I'm expecting some gift cards for christmas and I'm looking for a new lens. - slow--f/3.5-6.3, right at the hairy edge of being able to autofocus with Canon consumer/prosumer cameras; it also makes taking action shots at long FL problematic. - not really "wide angle" on my 30D or your Rebel 350D. The 1.6 FOV factor makes it equivalent to a 45-480mm lens. If you're talking about the 18-200mm, that's equivalent to 29-320mm, so that lens is "wide angle." For traveling, it may be OK, I guess, but I was so disappointed with the photos that I'd really look for something better, perhaps the new Canon 18-200mm IS--or just take my S3 IS (36-432mm equivalent). My "normal" lens now is the Canon EF-S 17-85mm IS, which is not the best (a 24-70mm f/2.8L would be better from an image standpoint), but it does have IS, USM (full-time manual focussing), uses a 67mm filter (it shares that with my 70-200mm f/4L IS), and is a lot sturdier. My other zooms go on both ends: Sigma 10-20mm, Canon 70-200mm f/4L IS, and Canon 100-400mm f/4.5-5.6L IS. The difference in image quality between the two L lenses and the Sigma 28-300mm can be startling, especially the 70-200mm f/4L IS. The IS lets me handhold the 100-400mm at 400mm down to 1/100, consistently. The 70-200mm f/4L IS is even better, about 3 stops: I have good images handheld at 200mm and 1/25 and some at 1/15. For low-light work, I have Canon primes: 24mm f/2.8, 35mm f/2 (equivalent to a "normal" lens on the 30D), 50mm f/1.8 II, 85mm f/1.8, 100mm f/2, and 135mm f/2.8. (The last is a "soft focus" lens, but is quite sharp in its normal mode.) I also have the 100mm f/2.8 Macro lens. If I get the 70-200mm f/2.8L IS, I'll get rid of the 135mm. I often shoot equestrian events in indoor arenas with terrible lighting, so the 35mm, 50mm, & 100mm f/2 all come in very handy to push up the shutter speed. I'd keep those even if I got a Canon 24-70mm f/2.8L. There's a BIG difference between 1/200 and 1/100 in shooting galloping horses. My husband and I have invested in Sony, and are having trouble deciding on our next lens. I was hoping there would be something listed here! So far, we only have the kit lens, and the 50mm f2.8 macro. We are not yet able to invest in the serious zoom lenses. Any advice? Great summary. and all my lenses are listed as the top 10 among all Nikon's fav lenses. - My 1st lens if I count off my D70 kit lens. I have been Using it for over 4 years, and still using it now. - I just got one of these tele lens(finally) after so long time admiring it. - Being using it for less than a year, I just love the AF-S compared with the previous model. - Being using it for over 2 years. I hardly use other lenses when i got this lens. My new Canon EFS 18-200 lens, purchased with a Canon D50, does not say 'made in Japan'. Does this say by default, 'made in China'? What is the quality difference if it is Chinese? Those results are not particularly surprising, although there is a big price range in the top 5, ranging from the expensive 70-200 f/2.8L IS to the cheap 50mm f/1.8. Finally some Pentax gear in here. The system is not as popular as Canikon but the glass is top quality, specially the primes. I am amazed that the 28-200 Sigma (Canon) lens does not feature. It is light compared to other lenses with the same spec and fits both mnual & digital SLRs. Also it is the ideal to lens to travel with as it acts both as a wide angle & zoom lens without the need to keep changing lens. With my Canon 350D this is an ideal lens for travelling and backpacking and takes high quality photos.